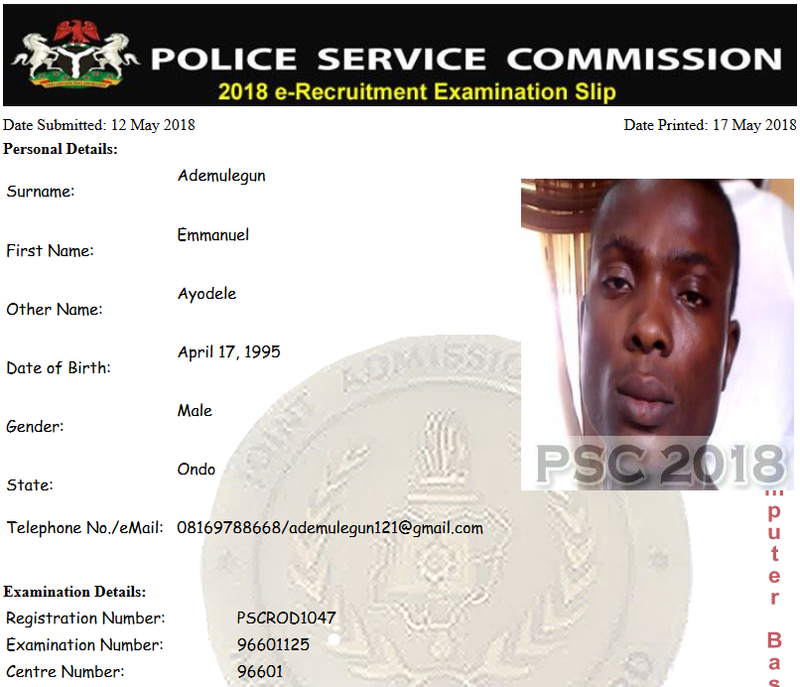 The Joint Admission Matriculation Board, [JAMB] 2018 Nigerian Police Service Commission [PSC] e-Recruitment Examination Slip Printing Procedures | How To Reprint JAMB - PSC - e-Recruitment Examination Slip 2018 | Nigerian Police Force Recruitment 2018 CBT Examination Centers, Time, State, Seat Number, and Date [jamb.org.ng/efacility/printpscexaminationslip]. This is to inform all shortlisted applicants of the Nigerian Police Service Commission Recruitment 2018 who has been duly screened in their respective States that they will be writing an examination which will be conducted by the Joint Admissions and Matriculation Board (JAMB). The Examination will be a written CBT aptitude test which is scheduled to commence nationwide in all the JAMB Accredited Centers in all the 36 States of the Federation. The Examination Date has also been announced and instructions given to applicants on the subjects/area of concentration on where the examination questions are going to be rolled out. Read here>>> Nigerian Police Recruitment (JAMB) CBT Exam Date, Time & Venue - 2018/2019. All applicants are therefore advised to log on to the Joint Admission Matriculation Board Portal to begin printing of their e-recruitment slip as from Tuesday 15th May, 2018. The exam slip which reflects each candidate exam schedule will be available for printing on JAMB portal. All PSC are advised to print their slips before Friday, May 25th, 2018, in order to familiarize themselves with the examination schedules as no form of excuse for missing the examination will be entertained. 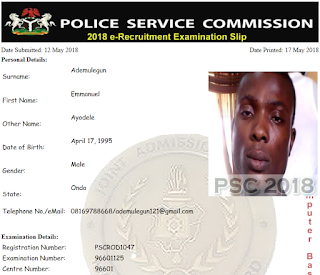 Check your name on http://www.policerecruitment.ng/ExamSchedule before you proceed to print your exam slip on JAMB Portal. How Print JAMB - PSC e-Recruitment Examination Slip Online. Reprinting of the JAMB - PSC e-Recruitment registration slip is quite easy. All you would be required to print your PSC exam slip that reflect your examination schedule is your PSC Registration Number. 2. Enter your PSC Registration Number OR e-Mail OR GSM Number in the appropriate column. 3. Finally, click on ‘Print Examination Slip’ to access your exam schedule. Note: Please allow popup for JAMB site (www.jamb.org.ng) from your browser . Login with either your email, phone number or the code generated for you by Jamb. Then print it out and bring it to the centre. The examination centres have CCTV coverage. You are allowed to come into the examination hall with pencil and rough work sheets. All rough work sheets must be submitted at the end of the examination.